This is very different from the Indian food I normally eat. Yes, it contains some of the same flavours, but somehow the mix of ingredients (or maybe it’s the aubergine base?) amounts to something lighter. More exotic. Superbly tasty. 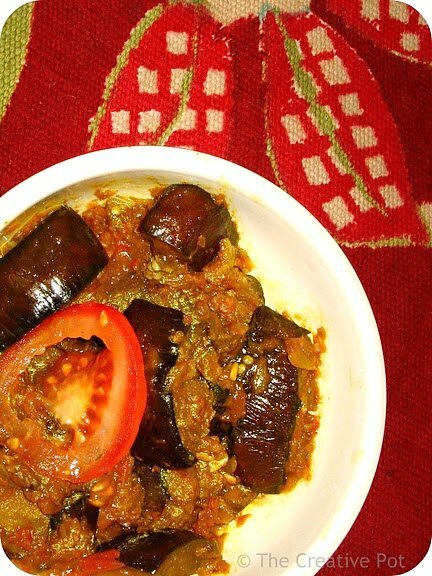 The eggplant almost melts in your mouth, so soft is it, and the tomato-onion sauce beautifully complements it. Definitely a keeper. 1. Toss aubergine with 1 tsp oil and some salt, then roast in oven at 180C for 20 minutes or until soft. 2. Heat the remainder of the oil in a large frying pan over medium heat. Add onion, sauté for 3 minutes, then add garlic and spices. 3. Cook another 1 minute, then add tomato. Reduce heat, cover and simmer for 10 - 15 minutes. Add aubergine, mix gently to combine. Add water, cover and cook for another 5 minutes. Serve, sprinkled with slivered almonds and steamed rice on the side. Gosh you are really turning exotic on this blog!! All the meals I've seen recently are just packed with flavor and they are so interesting!!! I stumbled upon your blog looking for some recipe that I am forgetting now. But just wanted to let you know that I am so impressed by your recipes, passion and photography. I too love to browse through blogs and recipes. You Indian recipes seem to be flawless. I am going to try to make your pumpkin naan! Great work! !